For this lamp I purchased an inexpensive lamp kit from Ikea. It consisted of the base, rod and socket, all wired up and ready. It was less than $10.00. To secure the spring, I attached a disk I made from wood scraps to the top of the spring, and sandwiched it between the socket collar and the spring. One of the projects that inspired me, from the book, were the use of old trouble lights in the decor. So I began to keep my eye out for old metal trouble lights at garage sales. They are not the easiest thing to find, but they are out there. I was able to put a few lamps together and I love them. A quick search on google brings up these images from various blogs. 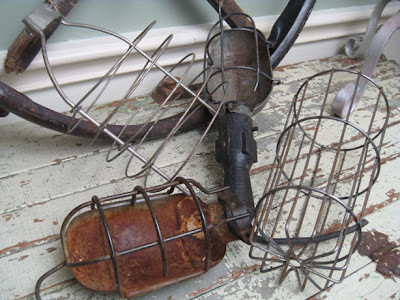 I love these old cages, they come in a variety of interesting shapes. If you are like me you might remember your Dad working on the car engine on a hot Summer evening, with one of these hanging from the propped up hood. As with most things, Trouble lights are now made from mostly plastic, and these beautiful metal ones are a thing of the past. Keep your eyes open and you might just find one of these treasures during the coming garage sale season. If you do, scoop it up, I have a feeling they are the next hot thing. First thing I did was to find the trouble light and an old base. You could easily make a base out of wood. I have a box of lamp parts, from lamps I've taken apart, and I found a short threaded bar in one of them and attached it to the lamp base. Then I drilled a hole in a dowel so it slipped over the threaded bar, and I glued it to secure it. If you want a more fancy look, use an old spindle instead of a dowel. Then I attached the trouble light to the wooden dowel with 2 screws, and wrapped the cord around the outside of the dowel. How you attach your trouble light will depend on it's design. Some have a clamp, you might be able to just clamp it to your dowel. I did paint the cord black because it was stained and dirty. The electrical seemed sound so I did not feel the need to re-wire it. Leaving the cord exposed added a little bit more of that industrial feel. If you can use a drill you can do this project. I seem to find things in spurts, and recently I've been finding work lights. You know the kind with those great metal cages around them. When I found this one I knew what I had to do with it. I was inspired by this book. Lamps can be made from almost anything. Here are some pictures of different items turned into unique lamps. In my search for home made lamps, I have found everything from the truly beautiful, the the absolutely bizarre. I hope you enjoy. This is a lamp project based on one of Ki Nassauer's projects. It's basically 4 spindles, attached to scrap wood on top and below. Then It needs to be wired as a lamp. See youtube video link below for instructions on lamp wiring. I'd like to say a quick word about safety. Please use common sense when doing any of these projects. Use Caution with saws and power tools. Remember to wear gloves and eye protection. We want you to enjoy years of junking and crafting, so please play it safe. Here's something you can do with those old cigar boxes. I made this lamp from an old wooden Tri-pod, I think this was one of Ki Nassauer's ideas. "I see you mentioned in your lamp design, you buy the socket kit at the hardware store.Im not sure what you pay for them. Out here they range from $5.85 to 15.00 depending on size ect. I pick up used lamps for .50 cents to 3.00 at garage sales church sales and just re-use the socket and stuff and then find creative ideas with the rest. Tina"
GreenBean Workshop made this unique lamp out of an old boom box. She says: "I took the guts out and painted it white (what else). I used the speakers for feet which you can't see very well in the pic." I love to see the younger generation jumping on the T2T bandwagon. This is a great project Caleb, thanks for sharing, and keep it up. Gayle Tells how she totally re-vamped this Garage Sale Lamp, "Started with an old $1 chandelier from a yard sale - I dismantled it - and spray painted the arms. Used wood, and an aluminum ruler for the base and made a new light fixture for my bathroom when it was redecorated." Brittany dog mom made this lamp from a 'Chinese Wedding basket that she bought at Bombay House. This idea came from kudzukween from Ivillage Garen Junk forum. OK it's not a lamp, but it used to be. Here are her instructions: "The tea cup birdfeeder was made from a cheap old chandelier, the arms used to hang down, I simply twisted the arms facing up and took out all the wiring. It won't matter,as long as it's flat enough to glue the saucer to it. I didn't sand it or do anything to it, but you might want to, this one was rusty,and I spray painted it white knowing rust would come back through which was the look I was going for. I looked for pretty cups and saucers at yard sales and thrift stores til I got 5 sets, for the 5 arms on this particular chandelier, they don't need to match. So pretty much scrounge up an old lamp, spray paint it, use silicone to glue the saucers to the lamp, glue the cups to the saucers, add some birdseed and hang it up. You could use any lamp that will work for you, mine had a chain already on it." This pink one was made by Skyler, and was made from a glass candy dish. "I just removed the dish and added the lighting fixtures. I found the shade at the flea market." The rule of thumb is that the shade should be the shape of the base. If the base is square or rectangle you should get a square or rectangle shade, if it's round or oval you should look for a round shade. The shade should be 2/3 the height of the base and 1/2" wider than the base on each side. It should be large enough to hide the socket and switch. This is a rule of thumb, the best thing to do is to take your lamp with you and try shades on for size. When you find the right one, you'll know it.